A braided main line is recommended for feature finding because it’s much easier to feel the vibrations due to braid’s limited stretch. A nylon shock leader or any heavy mono line is used to stop the tangles around the marker float on the cast. A tangle often occurs if no leader is used, because braid is so supple it twists on itself and folds round the marker float. When this happens the float will not rise to the surface. A pear shape of lead is best to use because there is more lead in contact with the bottom so all vibrations are amplified as they travel through the line. A stiff link and cork ball is used to help keep the running ring off the bottom and away from potential snags, such as weed, which may stop the floats from rising to the surface. A quick-change swivel is used so you can quickly change the weight or shape of the lead. The rubber bead is used to stop the running ring from catching on the eye of the float which may stop it from rising. Start by cutting off 8-10 inches of Amnesia stiff link and attach it to the smaller eye of the running ring. Using a baiting needle, carefully push it through the cork ball (or foam) then slide it onto the Amnesia stiff link. Once the cork ball is on, push it up the link until it butts up to the running ring. Tie on the quick-change swivel to the other end of the Amnesia then attach a pear shaped lead to the swivel. This part of the rig should be about 8 inches long. Now tie the shock leader to the braided main line using a double grinner knot. Slide the larger eye of the running ring onto the shock leader then slide on the rubber bead. Finally, tie on the marker float using a full blood knot. 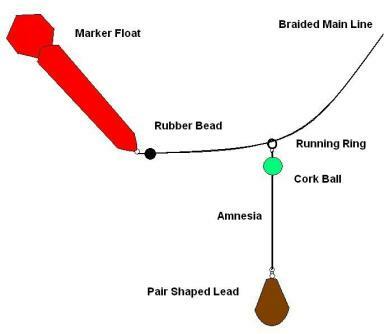 Diagram of a Basic Marker Float Set Up! Now you have a marker float set up you need to know how to use a marker float for feature finding.